It’s here: the ultimate boot showdown. The question of Red Wing versus Wolverine has been the most hotly debated since time immemorial (or at least since online message boards were invented) and with good cause. The two companies’ flagship boots — the Iron Ranger and the 1000 Mile — are true icons of American footwear. Both companies are super old, both boots are considered by many as the perfect entry level boot, they both have 270-degree Goodyear welts, and they both have cult followings. These are some of the most popular boots in America and because they’re so close in price, well, people are constantly comparing the two. Which comes out on top? While they have a lot in common, there are also a lot of key differences to take into consideration, particularly with regard to the leather, the sole, and most importantly how they aged — I have owned and worn both boots for months and unlike a lot of comparisons out there, I didn’t buy try on both boots and return one after walking around my living room. I’ve trudged through storms, hiked through blizzards, conditioned and re-conditioned these bad boys. And I think theres a pretty clear winner. 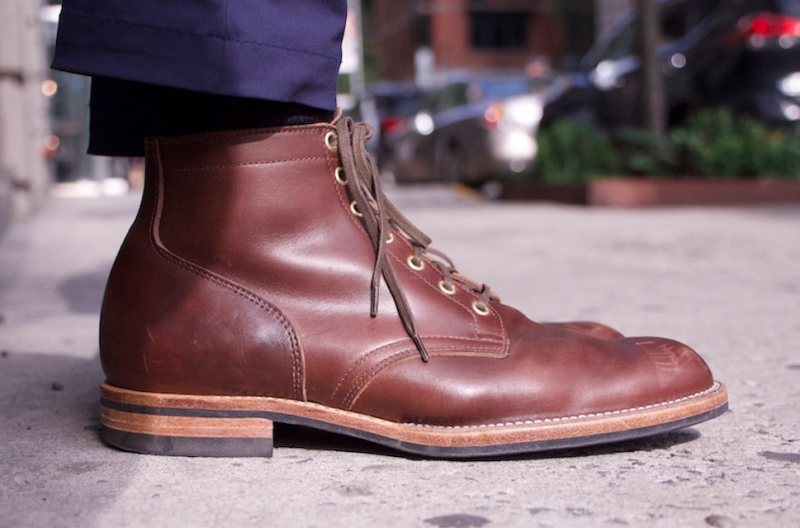 The defining feature of the Iron Ranger is the toe cap, which critics correctly call bulbous but I really like. It really emphasizes the fact that unlike the 1,000 Mile it’s not a remotely dressy boot. This is comfortably a work boot, designed to be reminiscent of the footwear Red Wing used to make for the iron miners toiling inside the Mesabi Iron Range in Minnesota. The functional aesthetic is further emphasized by the triple stitching, the shiny nickel eyelets, the thick oil-tanned leather, and the sole. The sole has traditionally been cork but if you’re buying Iron Rangers today, you’re in for a super functional Vibram sole; Red Wing changed all of the models’ soles from cork to Vibram in summer 2018. It’s instantly apparent that this is a more versatile boot. There’s no toe cap, there’s much less triple stitching, and the eyelets are more subdued. Like the Iron Ranger it has a 270-degree Goodyear welt and a cork midsole but the shoe aims for the title of all-rounder. It’s a pretty wide, to be fair — there are no illusions that this can double as a dress shoe, but the Red Wings are more outdoorsy and knockaround. The 1000 Mile is less eye catching, less unique, and blends more easily into khakis and a button down. Can you wear it with a suit? No. Is it inconspicuous? For sure. The leather is prettier, though, and less raw around the edges than Red Wing. Wolverine has opted for the world famous Chromexcel leather from Horween Leather Company, which has a rich pedigree and a richer depth of color, which I’ll discuss in more detail in the next section. In any case, it’s a nice, full grain leather that’s remarkably thick, certainly more than two millimeters. That means they’re no fun to wear in (expect blisters) but over the year that I’ve owned them, the leather has slowly and molded to the shape of my foot. That’s the thing with full grain leather: it becomes more you as it ages. 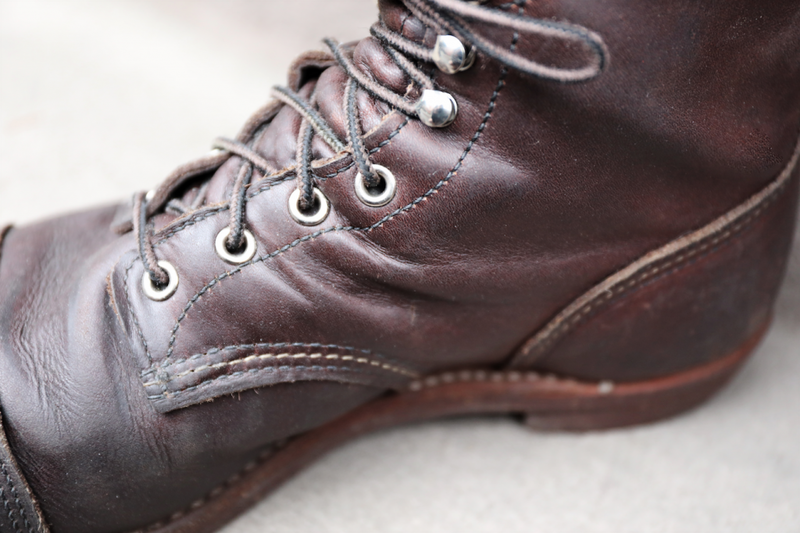 This boot was more rugged and stiffer than Wolverine’s, but it can take more of a beating. 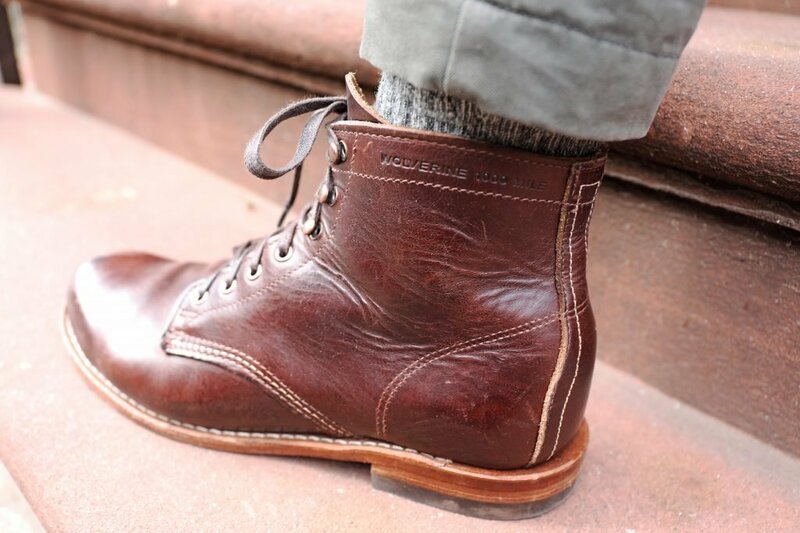 Chromexcel is a beloved leather from Horween Leather Tannery in Chicago that’s used in a ton of high end men’s boots, from super-expensive boots like the Viberg Service Boot and the Alden Indy 403 to regular-expensive boots like the Allen Edmonds Higgins Mill. It’s a combination tanned leather that’s made with 89 separate processes over 28 working days, during which the leather is stuffed with oils and waxes to produce an impressive depth of color. When compared to the Iron Ranger, the top finish is quite a bit more vulnerable to scratches and nicks, which is probably the biggest complaint with Chromexcel. The leather is pretty hard wearing, though, and when it comes to taking care of Chromexcel you can be comfortable with just using Venetian Shoe Cream, which Horween themselves recommend. Wolverine likes to suggest their own leather conditioner that’s made from mink oil and pine pitch, but you don’t need to reinvent the wheel, here. VSC works fine, but Saphir’s Renovateur is also one of Horween’s favorites if you’re more partial to a shiny boot. Now, I’ve worn better Chromexcel than this. 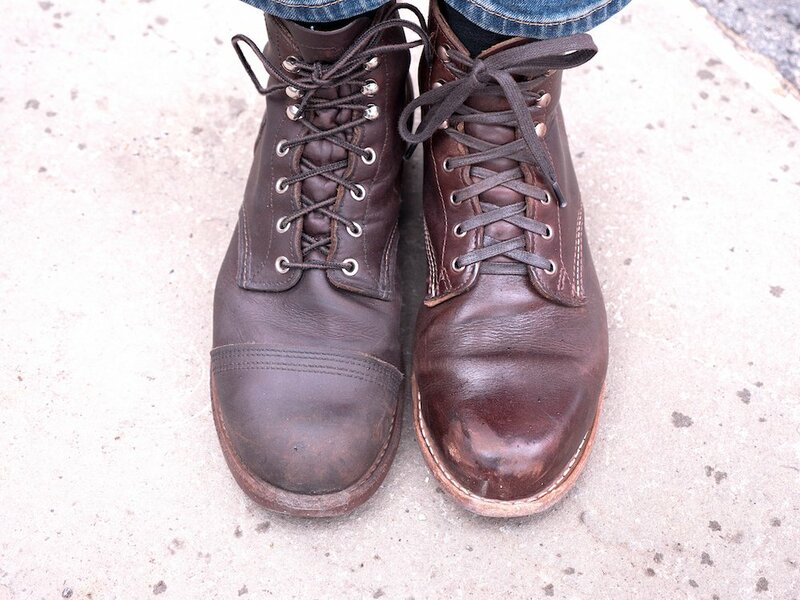 It was much easier to wear in than the Iron Ranger, but within one week the boot developed ugly creases all over the the shaft and the toe break. No, I wasn’t using shoe trees, but this was one week of wear. I can only conclude Wolverine’s leather selection isn’t top notch. My pair have a flat nitrile cork outsole, but as mentioned above if you bought your pair during or after summer 2018, you probably got the updated version with a 7-millimeter thick Vibram sole. Vibram is a great Italian rubber that has superb grip in rain and snow, but even my cork soles had decent grip, much better than the 1000 Mile. After the outsole there’s a steel shank for arch support and stability plus a cork midsole and leather insole, both of which slowly molded to the shape of my foot. That sole combined with the (reluctantly) malleable leather made for a shoe that really fits like a glove after the gnarly break-in period. The Goodyear welt is also worth mentioning since it boosts water resistance, but both boots have the same welt so it’s not great for comparing the two. The undisputed loser of this section, Wolverine’s flat, butyl-treated leather sole has very poor grip. While it does gradually improve as it gets worn in, you’re rewarded with a very ugly, scraped up outsole that I didn’t love at all. There is a Vibram heel to help reduce slippage and absorb shock, and I do have to hand it to Wolverine in that regard: it absorbs shock better than the cork sole from Red Wing. But since that shoe now has a Vibram sole I’m confident that today’s Iron Ranger has eclipsed the Wolverine in this regard. There’s also no shank, so a dress boot, plus the heel of my 1000 Miles started to detach after about a month of wear. 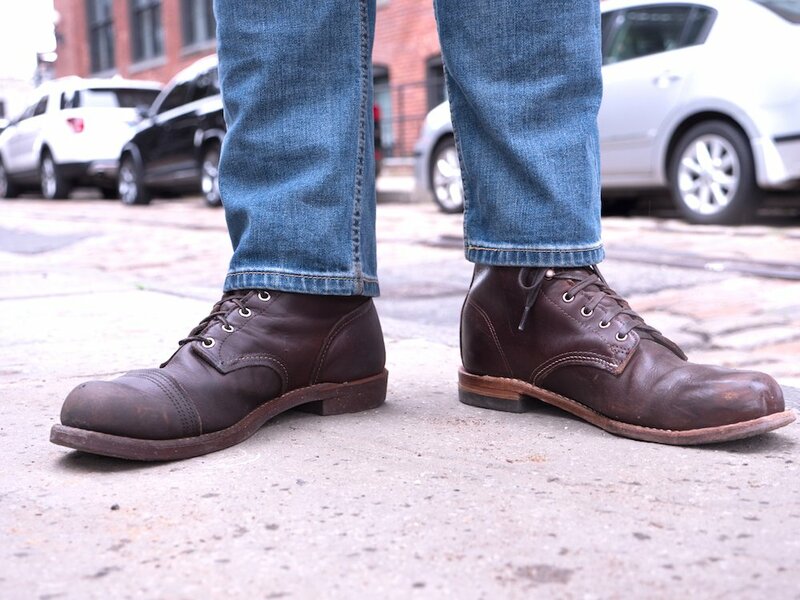 The Iron Ranger, on the other hand, has no issues with the heel after more than a year. The sizing is about the same for both brands: you should order a half size down from your sneaker size. I’m between an 11.5 and a 12 on a Brannock device but I’m a solid size 11 in both the Red Wing and the Wolverine boots. Width-wise, neither selection is amazing: Red Wing has D and EE, Wolverine D and EEE. Folks with narrow widths are out of luck. Both on Amazon and on Red Wing’s official site, these shoes run about $320. The price can fluctuate a bit and on Nordstrom in particular, they frequently go on sale for under $300. But if you want a pair of these bad boys today, head to Amazon for the best price. One pair will set you back $365 on Wolverine’s site but they’re also a little cheaper on Amazon, selling for anywhere between $320 and $360. It’s rare to see them under $350, though, so Red Wing is the clear winner on price. 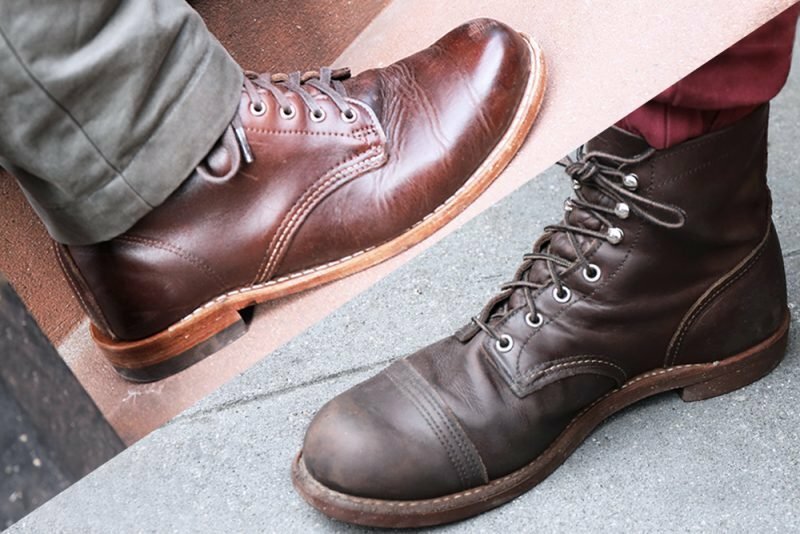 Red Wing Iron Ranger Vs Wolverine 1000 Mile: Who Wins? 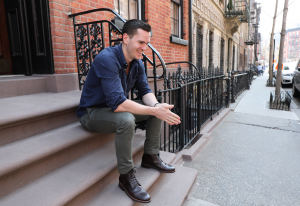 I wouldn’t hesitate to recommend the 1000 Mile if you were trying to decide between the two and you wanted a more formal boot that wouldn’t look as out of place with nice khakis. If versatility and dressiness is what you’re after, the Wolverine — while far from a dress boot — is your best option. But if you’re just looking for a high quality boot you can wear with jeans or khakis, go with the Iron Ranger. It’s cheaper, it has better grip, it’s better at supporting the foot, and most importantly it ages much, much better. Grant Stone Diesel Boot Review – Does “Made in China” Matter? I’d probably buy both boots if they were 360 degrees welted. What’s the point of having goodyear welted shoes if you’re gonna end up with glued heels? I pass. I mean they’re still able to be resoled, which is the main draw for most folks. I’m not sure about Wolverine, but the Iron rangers are nailed on. So I wouldn’t worry about durability. It makes it easier for a cobbler to replace just the heel, since that’s usually what wears down first. Thanks for your great reviews…Super helpful as I’m looking to purchase my first pair of good boots. I’ve got my eye on the Wolverine Evans 1000 Mile. It looks just like the 1000 miles but with a 360 degree welt and a rubber sole (from what I can tell). I’m also considering the Thorogood Dodgeville, but these have proven to be impossible to find. And I’m considering the Iron Ranger. Trying to decide between these 3. Do you know of anything I may be missing about the Evans 1000 mile? Thanks for this clear-eyed review. I’m actually a bit shocked about the lack of durability of the 1k boot -the fact that the heel started to detach within a month is pretty ridiculous. I really wish things were reversed since the look of the 1k boot is so much better to me than the IR. In the pictures it looks like you’re actually wearing two different sized boots, with the IRs about two sizes larger. Have you investigated the Evan style of the 1K? It has a Vibram sole and costs a bit more, so it may overcome some of the deficits you identified. Another option, looks-wise, is the Redwing Blacksmith. It has a look similar to the 1k but hopefully less quality control issues. I actually don’t know if you’ve reviewed either of these since it’s a bit hard to find a definite list of all your reviews -is there a link to an archive somewhere? I keep finding reviews I missed from the usual dropdowns Thanks!. Thanks again for the review, this was very valuable information. I actually ended up going to a Red Wing store (there was one about 10 minutes from my house). I tried on both the Blacksmith and the Iron Ranger. I have a weird size (they suggested I get a 7.5) so there was only Charcoal Rough and Tough for the Blacksmith and Oxblood Mesa for the IR. To my surprise the IR did not look as bulbous and rustic as I thought it would, but as the salesman pointed out a 7.5 will naturally look small (logical I guess). In any case I was very happy with how they both looked and I impulse purchased both pairs, figuring they would go with very different clothes. People have especially commented on how much they like the Blacksmith, but I’m happy with both. In comparison the IR has been much harder to break in, but this could be a function of the hardness of the leather type rather than the shoe. Thought I would pint out that now Wolverine has switched from the 270 t a full 360 degree Goodyear welt stitch. I first noticed it when looking at the custom options on the 1000 mile boot. The picture showed the stitching going all the way around. I then searched it and I guess they advo it by adding 360 to the end of a few marketing advo pieces to the name. But I think the Evans version taught them people wanted what was a very small cot addition to the boot. I personally like rugged boots so I love the Iron Ranger. I also like to wear in my quality boots shoes cloths. Thus I want it to last a nd last so I really like the thicker leather and longer break in of the IRs. But I must say they have cheapen out on the welt is so penny pitching and its effect on the highest sheer stress part of the sole, the heal just makes me less confident long terms i.e yrs old use with resoling etc. Its a shame as I want the IRs with the 360 degree or the 1Ks with the leather from the IRs. Can’t the two hook up and have a baby dammit!?! I like a boot with a decent breakin on a decent quality boot as to me it shows the leather is likely going to last. Its sort of like jeans from the premid 90s when they all went cheap on the demin. It took months to get fully worn in a good pair of levis. You also wore them numerous times before washing. But like so many footwear everyone wanted more and more profit which is the curse of any public traded company as shares MUST go up. Thus we have 10x the crap footwear and far less options for quality and in jeans its almost nonexistent. Not only that but people in general want instant satisfaction. Break in boots or jeans no way. Much better to use for a few months and throw away. Sad as they will never know the felling and satisfaction of pulling on a well worn in set of jeans and sliding your feet into those well worn in perfectly to your feet boots. It just creates such as secure satisfying mind set. It literally adds zen and over all confidence from something familiar and is uniquely your. So do you prefer Red Wing or Wolverine?? I would like to add my perspective on both of these boots. I own a pair of Iron Ranger 8111 for several years now (cork sole). I love them, they are still in great shape and seem to last forever. Recently, I was looking for a new boot and was impressed by the Wolverine 1000 Mile classics. Then I came across your head-to-head comparison review which was so elegantly and professionally presented, and extremely valuable followed by the 1000 Mile single review. It had me order a pair of the 1000 Mile the next day. I have them now for over a month, and enjoy them immensely. I must say the downsides you raised on this boot were incredibly accurate (creases quickly, less robust etc), but in my opinion there is something about them that is worth the investment. I have no doubt they will not last as long as my Iron Rangers, but I will make the best of them for as long as possible. Yeah the Wolverines are fine boots, Chromexcel is a nice leather, they’re pretty versatile. Definitely the Iron Ranger is tougher and cooler. But if you’re going to have two boots there are worse couples out there! Glad you like the site David, I appreciate your comment.